Movies usually need to make 373% to break even. 7 in 10 films lose money. Ever heard of RoI (Return on Investment)? 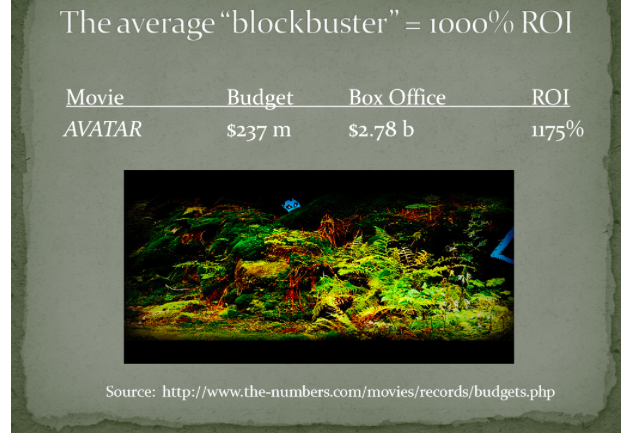 Film economics can be the ugly duck, usually ignored in film blogs. The fine people from Storyality posted two excellent articles on how hard is to make money in films: and On Feature Films and ROI and On Movie Blockbusters and ROI, Basic film economics made engaging and simple. This entry was posted in FILMMAKING, LINKS on filmmaking and tagged ROI, storyality. Bookmark the permalink.